How wise is political wisdom? A majority of all registered voters (55%) say they will consider candidates’ views on global warming when deciding how to vote. Among these climate change issue voters, large majorities believe global warming is happening and support action by the U.S. to reduce global warming, even if it has economic costs. Independents lean toward “climate action” and look more like Democrats than Republicans on the issue. A pro-climate action position wins votes among Democrats and Independents, and has little negative impact with Republican voters. These patterns are found nationally and among ten swing states. So, what’s going on? Why the difference between the common political “wisdom” and these findings? “80 percent support action to reduce global warming, even if it has economic costs,” the study reports, but that’s different from what we hear elsewhere, and way far different from what that political wisdom believes. 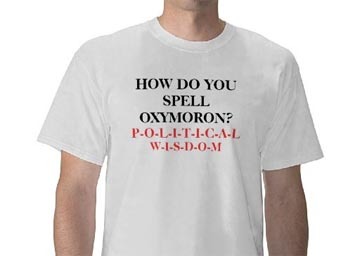 Yes, it’s a cheap shot and I lifted the image from a Tee Shirt site. The explanation, of course, lies in where the money and influence come from. No new news there. And it still leaves us with the question of how to balance that undue influence. Maybe with better slogans? That might be a start at least. Why is this significant? The largest component of hidden costs or externalities in the oil industry, even when spills are included, is climate disruption. The largest causal factor there is carbon emissions. And what’s the simplest way to tie carbon emissions to the hidden costs of climate disruption? Carbon pricing. 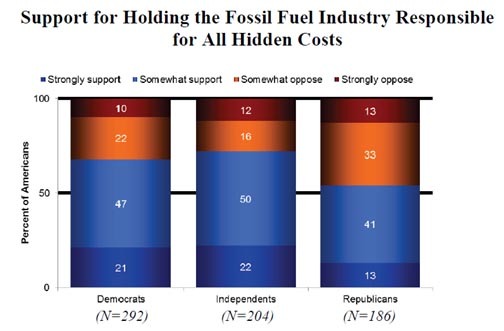 According to that chart, somewhere around 60% – 65% of voters support true costing of oil. Stands to reason, then, they should support carbon pricing. Yet mention of any kind of carbon pricing, whether it’s called a carbon tax or cap-and-dividend, falls into the black hole of politics. It’s a disconnect, obviously. “We like this idea,” polls indicate, but not when you call it something else. Which brings us right back to the issue of communication and EcoOptimism. A lot of people have been concluding lately that rational or scientific explanations and arguments do not work in the public sphere. 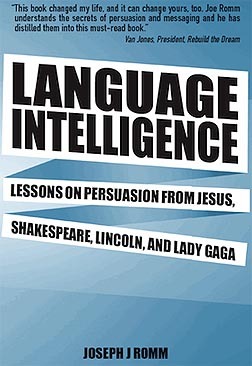 With that in mind, I’m very curious to read the new book Language Intelligence: Lessons on persuasion from Jesus, Shakespeare, Lincoln, and Lady Gaga. It’s written not by a semiologist or a political flack, but by the head of ClimateProgress and claims to “reveal the secrets of the world’s greatest and most memorable communicators.” If a climate wonk like Romm can help us find ways to more effectively get “the word” out, then we may have solved a significant part of that disconnect, and be better able to make the case for EcoOptimism. This entry was posted in Messaging, Politics and tagged carbon pricing, externalities, fossil fuels, Joseph Romm on August 20, 2012 by David Bergman. Interesting, with Republicans especially I would have thought otherwise. The problem is that the carbon creators have big bucks. Democrats in Congress are probably urging the President to stay away from issues that might send campaign money in the direction of their opponents.